Today we transferred to the Old Faithful area, travelling through the centre of the Yellowstone Park by Snow Coach. We picked up our Snow Coach at Mammoth Hot Springs and drove south towards the Norris area, stopping briefly at Roaring Mountain. From Norris, we headed east to the Yellowstone Canyon, where we visited both the North and South rims of the canyon for views of the Upper and Lower Falls of the Yellowstone River. The Upper Falls are 109ft high, whilst the large lower falls are 308ft high, and are the largest volume falls in the Rocky Mountains. In winter, the foot of the Lower Falls is obscured from view by a large ice wall that forms from spray thrown up by the waterfall. This wall is probably about 100ft high. After visiting the canyon, we continued south, stopping at the Mud Volcano area for a view of Dragon’s Mouth Spring before arriving at Yellowstone Lake. 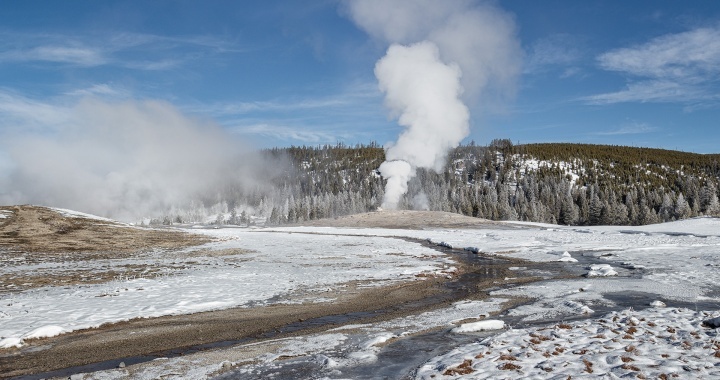 We then visited West Thumb geyser Basin, for a view of Bluebell Pool before finally arriving at the Old Faithful Snow Lodge – the only winter accommodation at the Old Faithful area. This morning our group had a snow shoe walk through the forest, but before breakfast we went out to watch Old Faithful erupting. The morning started rather misty, but this soon cleared away, and by the time of our snow shoe walk the day was clear and sunny. After lunch, we were due to take part in some cross country skiing, but as the day was so good, we decided to walk round the geysers of the Upper Geyser basin instead. Our intention was to walk out to Morning Glory Pool at the end of the boardwalk, but the last part of the walk was blocked by a large bull bison grazing next to the path. The only one of the main geysers that we caught erupting was Castle Geyser, though Grotto geyser was also throwing out some water and steam, which it seems to do most of the time. Today was quite a change from the previous day, with lots of thick cloud and some snow. Early in the morning we decided to head past Castle Geyser and aim to get to Morning Glory Pool, which we had failed to reach the previous afternoon. Due to the poor weather it was very quiet, but we met a Park Ranger who told us that Daisy Geyser was due to erupt, so we waited for that. We also knew that Riverside Geyser was due to go erupt, but we had to wait almost two hours before it went off. We then headed past Morning Glory Pool to Artemisia Geyser. By this time the weather had closed in quite a lot, so we returned to the hotel for some lunch and spent a quiet afternoon in the hotel.